Two technicians have since been arrested. 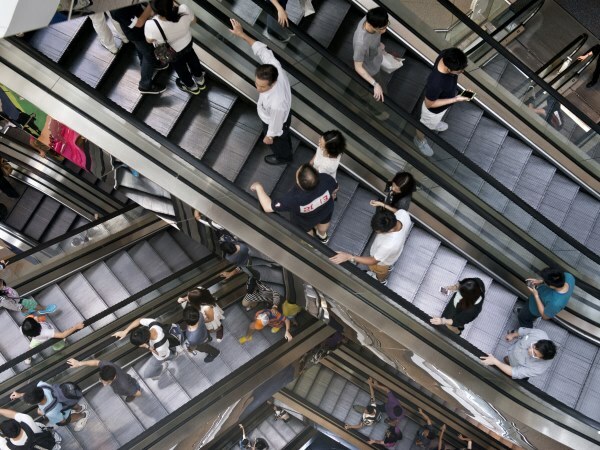 An escalator in Langham Place, Hong Kong, went the wrong way on Friday, injuring 18 people. After the incident, two technicians were arrested after allegedly trying to cover up the cause of the accident. The escalator suddenly reversed direction and CCTV shows a mass pile-up of shoppers dropping to the floor. The incident was apparently due to a chain and emergency brake malfunctioning on the 46 m escalator. This was after the escalator had already passed an inspection last week. According to South China Morning Post, a government source said it is possible that the auxiliary braking system which should have been turned on when the incident happened had not been turned on. The technicians are suspected to have tampered with one of the escalator's key braking systems during the inspection to determine the cause of the incident. The technicians belong to Otis Elevator Company in Hong Kong and are suspected of having turned on the system when government engineers were inspecting the escalator on Saturday night. The two were arrested for "perverting the cause of justice", according to The Guardian. A spokesman for Otis said, “The arrest of our mechanics was a surprise. Our mechanics were asked by the EMSD to provide on-site support for the inspection of the escalator at Langham Place". “In fact, our mechanics were released on bail and without any charge filed,” he continued. The company has been ordered to submit a report on the cause of the accident to the Electrical and Mechanical Services Department (EMSD) in Hong Kong within seven days. With the escalator being out of action for at least a month due to the replacement of components as well as tests needing to be carried out.